Fig. 258. Положение эндокринных желез в теле человека. Вид спереди. 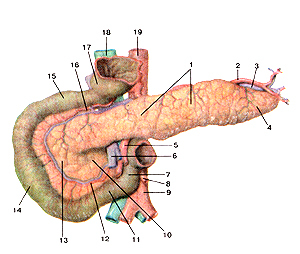 1-hypophysis et epiphysis; 2-glan-dulae parathyroideae; 3-glandula thyroidea; 4-glandulae suprarenales; 5-insulae pancreati-cae; 6-ovarium; 7-testis. Fig.258. 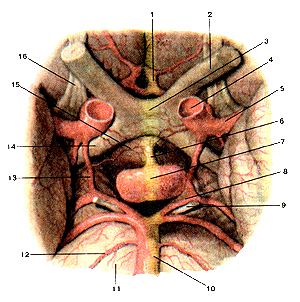 Situation of the endocrine glands in the human's body. Front look. Рис. 259. Гипофиз (hipophysis) и его взаимоотношения с кровеносными сосудами головного мозга и с черепными нервами. Вид снизу. Fig. 259. 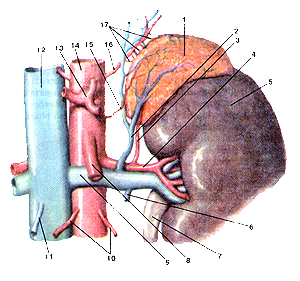 Pituitary body and its interrelation with blood vessels of brain and cranial nerves. 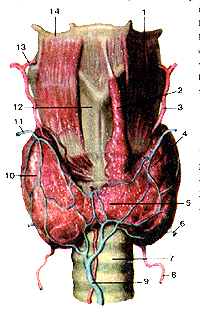 Inferior aspect. Fig. 260. 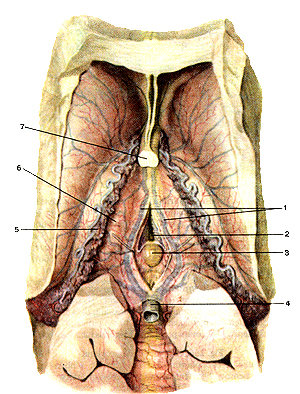 Pituitary gland. 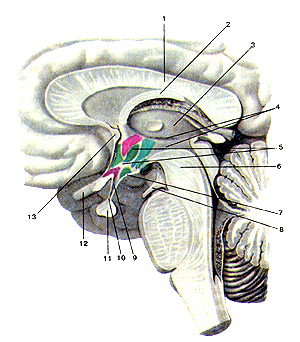 Situation of the body in the region of the base of the brain. 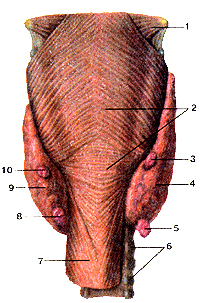 Sagittal section. 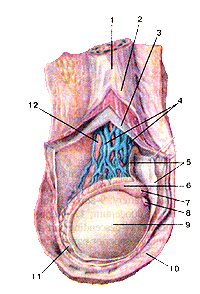 Medial aspect. 1-corpus callosum, 2-fornix; 3-thalamus; 4-third ventricle; 5-hypothalamus; 6-midbrain (mesencephalou); 7-tuber cinerum; 8-oculomo-tor nerve: 9-infundibulum; 10-pars infundibulan's (infundibulum) of pituitary gland; 11-pituitary gland; 12-optic chiasm; 13-anterior (white) commissure. Рис. 262. Паращитовидные (околощитовидные) железы (giandulae parathyroidei). Вид сзади. Fig. 262. Паращитовидные (околощитовидные). Вид сзади. 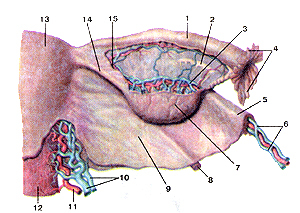 I-m.constrictor pharyngis medius; 2-m.constrictor pharyngis inferior; 3-glandula parathyroidea dextra superior; 4-lodus thyreoidea dexter; 5-glandula parathyroidea dextra inferior; 6-trachea; 7-eso phagus; 8-glandula parathyroidea sinistra inferior; 9-lobus thyreoidea sinister; 10-glandula parathy- 4f roidea sinistra superior. Рис. 263. Надпочечная железа (надпочечник, левый) (glandula suprarenalis). Вид спереди.